An knowledgable man once said, “creativity is intelligence having fun.” Good old Albert Einstein predicted the future in not just the world of knowledge, but the creative world as well. Little did he know that creativity would turn into passion. That passion could then turn into the art of collection. For me, my passion of collection is art (could you have guessed?). I truly believe the art one buys or creates is a direct reflection of their inner self. For example, one of my favorite pieces that I own is my bright yellow ‘Have Mercy’ palm screen print. I bought it at a small, eclectic shop in Asheville, North Carolina for $25. It wasn’t an investment piece. I didn’t research the artist for hours. I didn’t have to ponder for two seconds about whether or not I was going to purchase the 20 x 30 inch poster. I bought it simply because I liked it. It is graphically bold, it is colorfully bright, and it has a message. It became the focal point of my gallery wall as soon as I got home. Accompanying Mr. Have Mercy on my walls are framed illustrations that I ripped out of Communication Arts magazines, an abstract wood panel painting my good friend Natalie Taylor made for me, and vintage posters I’ve found over the years. It’s all collected – all random. Each piece has a significance. Rule #1: Art should feel collected. Stay away from the stock pile people! Yes, that means you, Hobby Lobby enthusiasts. A significant collection of art should develop over time. Not every piece needs a dramatic story, but some pieces do. Collected art gives your home a personality. It’s what makes your home different. Art Fairs & Student Work– Fairs are a great place to find local artists outside of their galleries. Most art fairs will sell unframed art which is usually cheaper than buying it pre-framed. Pair the purchased piece with a painted Goodwill frame and you now have an original piece. Local universities also have art shows throughout the school year. In the case of having creative friends like I do, ask a friend for an original piece and offer to compensate them for it. Souvenier the right way – Following in my mother’s path, I like to look for new artwork when vacationing. It’s a chance to scope out local artists that are unknown to your home town. Plus, it makes for a better memory than that Mexico coffee mug. Online – websites like Etsy and Society6 offer loads of original work at a range of prices and sizes. Look at more than just “art” – Calendars, greeting cards, or even pages of art magazines or books make great framed artwork. 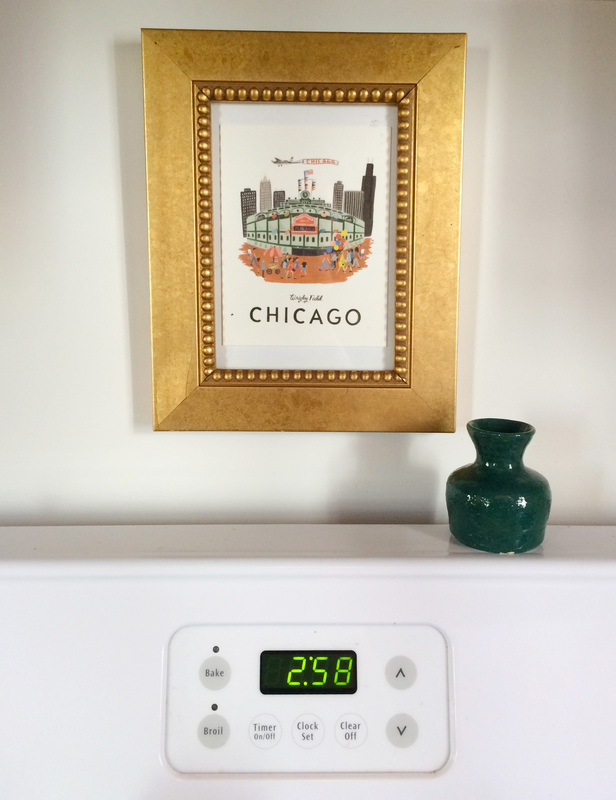 I framed Rifle Paper Company‘s Chicago greeting card above my stove for a little piece of home in my kitchen (above). 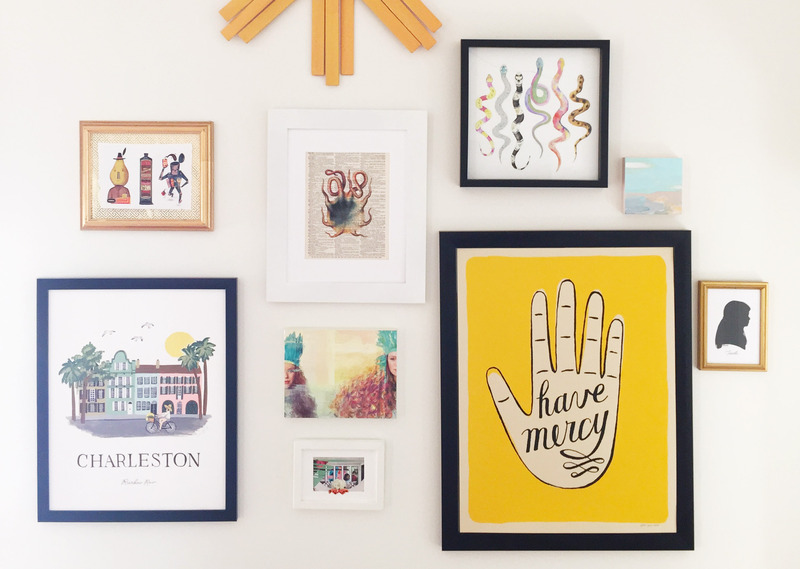 DIY the art you love – Having a fine art degree, I tell myself “you can make that” a lot. Mimicking art you admire is one way to display personality in your home. The trick is to put your own spin on it. I created the abstract gold circle painting (shown hanging over my couch, above) on an old Hobby Lobby canvas and added spray painted L-brackets I found at Ace Hardware. The piece was inspired by abstract art I found on Pinterest. Note: Be sure to respect the artist’s work and abide by intellectual property laws! 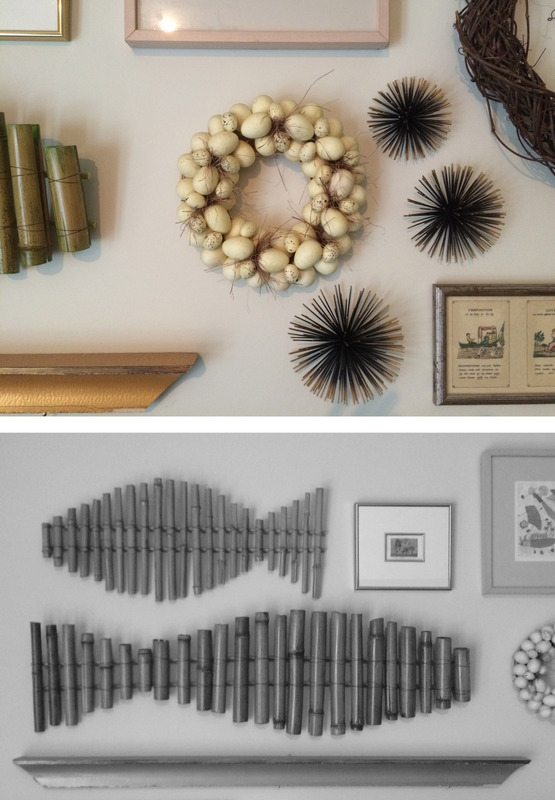 Found art is just as it sounds: found objects that are turned into art. My friend Skipper introduced me to the concept one Saturday afternoon over a bottle of champagne. Skipper goes on to explain how she not only inherited the artwork of the role models before her, but she also inherited their love of found art. The distressed gold mantle hanging above her tv was found on the side of the road on King Street. Bottom line? There really are no rules. A piece of drift wood is just as much of art as a painting. What’s important is the self expression and originality behind the art. Make it you – not just a filler piece – and collect away! Thank you Skipper for letting me photograph your tremendous collection! Well done Tarah, liked this very much! Thank you for warning people against places like Hobby Lobby for art. It won’t be art you value over time, I know from experience. lol Don’t get me wrong I shop HL but not for art. You can find art made with love and attention, as you’ve pointed out, everywhere and it can be affordable.